I’ve had my eye on Magellan Gin for a while. Something about that ethereal blue tinge in the nicely decorated bottle. When I saw my local store had a gift pack with an attractive, hand-painted glass, I decided to finally give it a try. Magellan is made in France from wheat. It is triple distilled with juniper, cloves, cardamom, nutmeg, grains of paradise, licorice, cinnamon, coriander, orange peel, cassia, and iris. According to Magellan’s web site, there is then a “fourth distillation,” which sounds more like an infusion, when additional iris root and iris flower are added to give Magellan its distinctive floral scent and blue tinge. The scent is quite prominent on the gin. Having recently been experimenting with crème de violette, it’s difficult to avoid the comparison. The iris in Magellan strikes me as a little crisper and less potpourri-like than many florals. When tasting, the iris is definitely there. It’s a new taste to me, but it has the qualities I associate with flowers, including the mouthfeel, with a slight acidity and some oiliness to it. If you don’t like floral infusions, you will not like Magellan. I like both. It is immediately apparent this isn’t a general-use gin. I can’t imagine using it in a Martinez, as I suspect the unique flavors wouldn’t mix well with sweet vermouth. I’m not sure it would make a pleasant gin and tonic, either. But I did experiment with using it in a gin daisy, which was quite pleasant. It also shined in a French 75. The champagne helped increase the bouquet and made it a very pleasant drink. The underlying gin is robust; this isn’t a one trick pony. The cloves and other botanicals give a nice spicyness that keeps the iris from becoming too cloying. Given the iris finish, I had to try the Magellan in an Aviation, one of my favorite gin drinks. I went with Gary Regan’s Joy of Mixology recipe, as found in the Kaiser Penguin recipe comparison. It’s my favorite Aviation recipe. 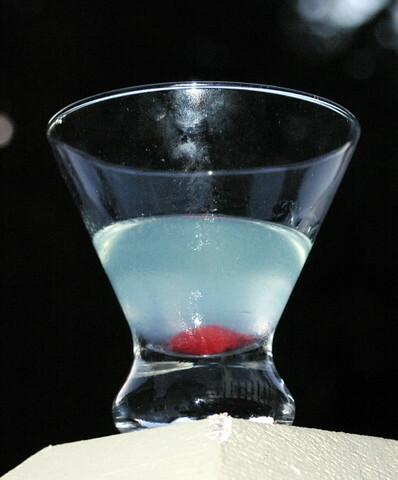 As I’d hoped, the blue of the iris held out in the glass, creating a beautiful looking drink that mimic the color of the original violette recipe that is purported to be the source of the name. But the proof’s in the drinking, and this is a mighty find tipple. The same floral notes that made me fall in love with using violette in the aviation is there, just slightly different. This may be my new favorite take on the Aviation, as this is less sweet than when using violette. If you like the violette version of the Aviation, I highly recommend you give it a try using Magellan. shake over ice, double strain into a chilled cocktail glass, garnish with homemade brandied cherries. The ones I’m using now were made with this recipe. Delightful! What other cocktails do you think Magellan would work well in? I like Magellan, but haven’t used it too much; the only thing I’ve tried to to pair it with is vermouth bianco. The straw tones of that vermoth blends with the blue to make a nice pale green. And it makes it a sweeter martini, but the aromatics of both blends together nicely for me, with an additonal note of vanilla. I acquired a bottle of Magellan on a cruise ship and liked it a lot. Very recemtly at a bar in the St. Francis Hotel in San Francisco I tasted a new Swedish gin called RIGHT which was also very tasty (I’m not a vodka Martina person). I’m looking for someone who sells both.